Feat. 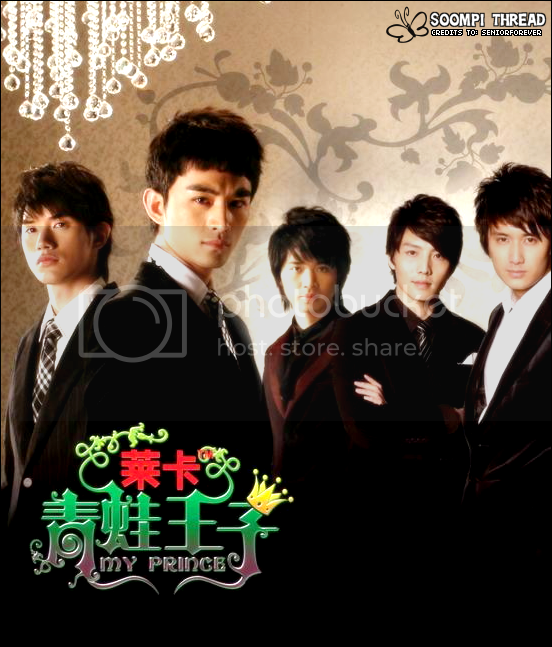 The Top Winners of "My Hero Competition 2006"
My Prince tells the story about an ordinary family, a mother who loves money and her four handsome sons. Li Xiu Yun's biggest wish is to see her sons get married to some rich girl. She's lazy and spends most of her time gambling or talking with the neighbours, letting her sons run the household and her small flower shop. Her oldest son, Zhi Kai, works as a team leader in a company. He's very serious about work and cares a lot for his family. Second son, Zhi Wen, is a unknown model. He's popular among the girls and likes spending his sparetime by bars and clubs, flirting with girls. Of course his big brother has to then help him pay the bills. Zhi Chen, the third son, is more quiet and doesn't talk much. He works in a winebar as a bartender. The youngest of them all, Zhi Xiao, is very helpful and helps his mother run the flower shop. He's good at doing handworks. When he was little he got very high fever, which turned him to both deaf and mute. But he still keeps smiling like nothing has happened. Everyone like him and his brothers are all very protective of him. Any info on the girls in this? is this a new series or has it been out for a while?? Oo.. hot guys. Any bt links? It sounds super interesting.. I feel sorry for Song Xiaopo cause he's kind of typecasted forever into roles where he plays the mute character. they're new people, so yea. This series started showing March 2007 and finished showing around May 2007. So it's pretty new. The main lead looks quite handsome. I haven't heard of this series before but will give it a try even though i can't understand Chinese. Thanks a lot for sharing the links! ^ I don't think so. I don't think a lot of people know about this series. That's why. Hm, but I wish someone would pick up this series and start subbing! I think it's cause it's from mainland China and those get subbed every once in a blue moon. I'll faint from disbelief the day a mainland Chinese series gets subbed that doesn't have wuxia or Taiwanese actors. Btw, I'm up to episode like 6. It's sooo much better than I expected. I just thought there was going to be mucho eyecandy , and there is...I love the fact that Chen Zheyu and Bin Wei are there too! The only way this could be filled with more pretty is if there was Ma Tianyu too. The guy from the office (Zhong Kai's coworker) is cute too, does anyone know who he is? Anyway, I like the stories in it as well, and I found myself laughing out loud which I rarely do. And all of their acting is pretty good except maybe Wu jianfei and Wu Diwen (although his relationship with Song Xiaopao seems very real and touching). It's really a good drama .. really deserve to be subbed & share it with other..I hope to see it with sub cuz I don't know chinese ..
Awww, I hope this drama gets subbed. The guys look HOT. ^ Yesss there's a lot of romance. The drama alternates between each of the four brothers. But i think the main theme in the drama isn't romance, but rather family. The four brothers and their mom are really close, and you can tell that the family matters a lot too them, and they support each other even though they fight A LOT lol.